I fell asleep with this idea forming, and after a pile of IQ quilted quilts, I decided I could spare a day or so to play a bit. This is an experiment and a prototype, there are several things I’d do differently, and I’m not completely sold on doing this with just thread. The lacy look is kind of cool, but the red and black thread on white is extremely unforgiving. I’m also a little bit out of practice on my freehand skills, so there’s that as well. I realized yesterday that I had stopped posting weather updates. I think I was trying to ignore the fact that it’s done nothing but rain. OK, it does clear off for parts of the day, but several baseball practices have been called off, and tonight’s game was cancelled. Not actually raining, just too muddy. And humid. Which has meant that the purple air erasable marker I was trying to use on the ladybug? Gone in minutes. I crossed the 100 miles logged today, most of it’s been on the elliptical — 3 miles today, in fact! When I started this adventure, I’m pretty sure Mark thought I’d last about a week. It’s actually been almost 2 months! It’s about being healthy, not losing weight, but…I *am* losing weight (3.5 pounds down since the start…which includes a big jump of 5 pounds gained when we went to New York***), and my waist is down a whole inch! ***Apparently you can’t sit in a car for 40ish hours doing nothing more strenuous than knitting and playing Sudoku and expect to be able to eat the same (or more! since so much of it was fast food…) than you do when you are active. Whodathunk. Cleverly done, Suzanne. I like this quilt… perhaps a taupe fabric would work better? And congrats on the elliptical and your 100+ miles. That should show Mark! hah. I love the concept behind this quilt! I can see though how red/ black on white might show every little bump along the way. Maybe you need a mottled background and a variegated thread to fool the eye. 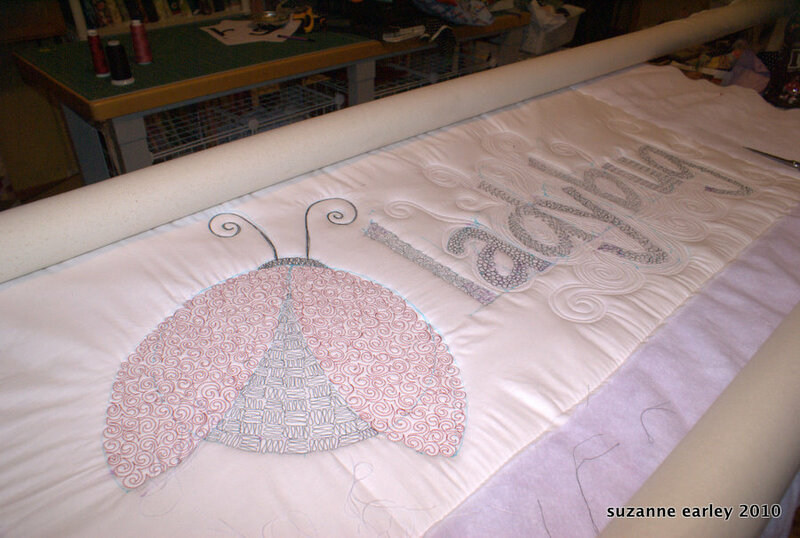 Love the ladybug quilting fills. Very cool.